Ring, ring, ring… ring, ring, ring; that’s exactly what didn’t happen for some iPhone users whose alarms never spoke on the New Years. Apple’s famous iPhone and iPod touch failed to wake up their users on the first day of 2011 that left many unsatisfied and asleep. The glitch was felt around the country and around the school. Senior Alex Geli came face to face with the alarm glitch not only once but twice. Apple told Engadget, “We’re aware of an issue related to non-repeating alarms set for January 1 or 2. Customers can set recurring alarms for those dates and all alarms will work properly beginning January 3,” the Apple spokesperson said. On January 1, Apple realized that there had been a glitch with the alarms and noted that it would be fixed by Monday, January 3. But alarms remained incoherent for the fourth day in a row leaving users fuming. On New Years day, people were late to work, missed important appointments and flights and overslept. Many users say not only are their alarms not going off but also their calendar events would not sound. For some reason, this iOS alarm glitch is not affecting everyone and many believe that the problem is within the software itself. Apple issued a statement advising many of its phones would not work at the start of 2011 but the warning was, obviously, missed by thousands of customers all over the world. The glitch effected non-recurring iPhone alarms which stopped working for devices running iOS 4.02, 4.1, and 4.2.1. This is not the first time Apple phone users encountered a problem. Back on October 31, the so-called “smart phone” failed to recognize the turning of the clock back one hour (Day-Light Savings). Apple iPhones have had many problems ever since they were put on the shelves and have many questioning how smart they really are. With all of these malfunctions occurring, Apple is losing the interest of people wanting to buy their product and will have to win back their fans. Here at Penn Manor, some students and faculty experienced this glitch at the best of worst times. Technology coach Shawn Canady has a son in the Marine Corps who had to return to San Diego on Sunday. Canady’s son got booked on the next flight but instead of flying to D.C. and then to L.A. with a one hour layover, Tison had to fly to Chicago and then L.A. with a 13 hour layover. Tison’s flight was to arrive at 3 p.m. on Sunday but never got to L.A. until 1 a.m. on Monday. Canady explained that this glitch only happened to non-reoccurring alarms and not ones set weekly or for weekdays. By Jan. 3, Geli suspected his alarm on his iPhone was not working. So Geli tried his alarm again on Monday to wake up for school and set two alarms, one at 6:30 and the other at 6:45. 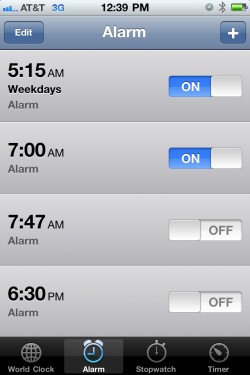 Luckily, Geli set another non-iPhone alarm, the old-fashioned kind, and was not late for school. Just remember, smart may not always be what it sounds. i was affected twice. once on daylight saving and once on new years! 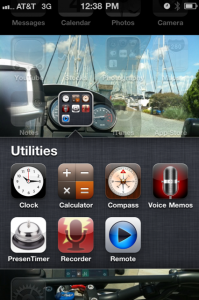 i just disabled all alarms and started using another alarm clock – Apple needs to get their act together!